As painful as it might be for some let's rewind the clock and go back to the early days just after Twinn Peaks then back to the present. Some truths have been played out and it's out there for everyone to see if you care to look. We found evidence at the Lone Star Bike Rally in Galveston this past weekend. ​Bandido leader Gimmi Jimmy stated publicly that there were not and never were kill orders against law enforcement. Turns out the DPS issued false communications just hours after the Twinn Peaks massacre. Bikers may be coming to Waco with stolen munitions that included C4 provided by military members. Even McLennan County Sheriff McNamara fell for that one. We think we have the right to know what Einstein within the DPS issued that communique. Was it based on real evidence or pie in the sky reports by so called experts. Fast forward, 21/2 years later Jake Carrizal's trial we've not seen one shred of evidence of kill orders against police officers the city of Waco or McLennan County, matter of fact during the parking lot fight not a single shot fired at law enforcement has been produced during trial. Once the Bikers recognized officers on the scene killing with high powered rifles there was total submission by Bandidos & Cossack's involved in the parking lot fight. Under the Constitution 1st Amendment the TXCOCI had every right to peaceably assemble at Twinn Peaks / Waco whether Cossak's, Waco PD or any other government organization liked it or not. Just as the TXCOCI has been doing for two decades without indecent. It's the fact Waco PD met with everyone but event organizers that takes away all Waco PD credibility and Able Reyna's case, it just doesn't pass the smell test. There is now more than enough evidence to see that either the Cossack's were duped or given a false impressions on what was going to go down at Twinn Peaks. Rewind again! Gimmi Jimmy stated publicly and numerous time that the Bandidos didn't care about Texas Rockers, the issue was settled back in 2014 according to an interview we did with then Bandido President USA Bill Sartelle. The video above shows Jimmy's views on Texas Rockers along with other issues at the time. If strong language offends you beware this is not boy scouts. Fast forward 21/2 years later Gimmi Jimmy's comments are so true. On our weekend trip to Galveston we found more than enough evidence to back you Gimmi Jimmy's claims on Texas Rockers. Yes! Law Enforcement Clubs were wearing Texas Rockers along with some women Clubs we did not get pics of. OMG! Who else was on the scene? 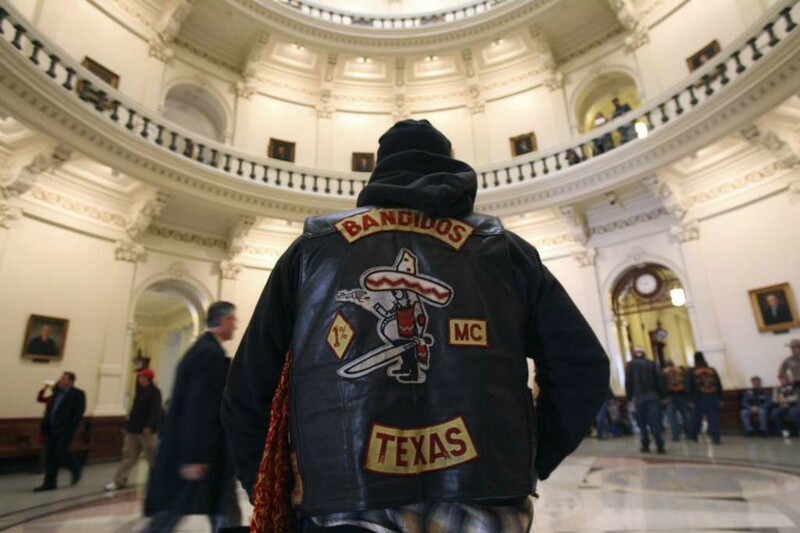 "Bandidos" and not one cross word over Texas Rockers was heard. Everybody got along in a city that understands the culture. To top it off the Bandido sales in their R&G booths were doing a brisk business. Just our observation on Saturday night. Able Reyna has spent considerable time trying to convince the jurors and the public the issue at Twinn Peaks was over Texas Rockers. The DPS has been proven wrong time and time again with false claims. It's more than likely those claims came confidential informants who many times help escalate tensions in order to make something happen when there is nothing, of course there are reasons they are CI's in the first place and it's not for winning outstanding citizenship awards. The Cossack's see it differently with claims they were invited to parlay with TXCOCI leaders. But that's another story coming soon. Texas Rockers from Texas Biker Radio on Vimeo.